A pendulum swings to 90% of its height on each swing and starts at a height of 80 cm. The height of the pendulum in centimeters, y, is recorded after x number of swings. 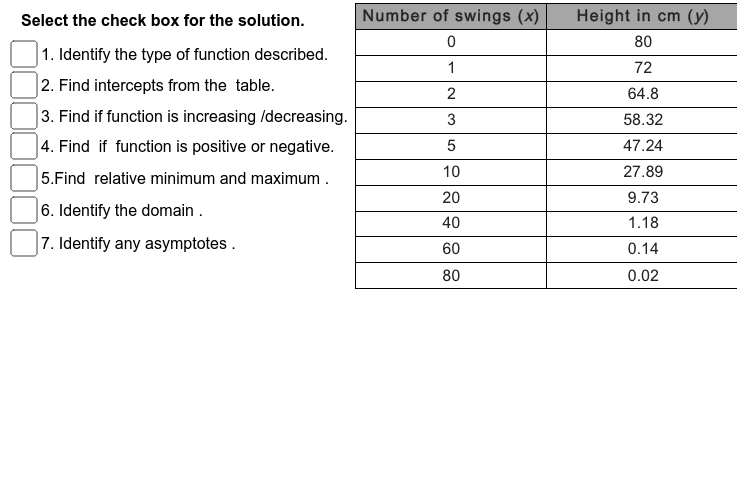 Determine the key features of this function using the table below. Then answer the questions below. After you are done asking the questions, then check your answers by checking the boxes. Identify the type of function described. Identify the intercepts of the function based on the information in the table. Determine where the function is positive and negative. Determine the relative minimum and maximum of the graphed function. Identify the domain of the graphed function. Identify any asymptotes of the graphed function.